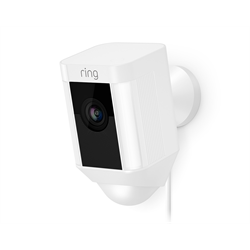 Protect and monitor your home with the Ring Spotlight Cam high definition WiFi camera. The spotlight provides high definition 1080p video, with built in microphone and speaker for two way audio. View live video and listen in any time from anywhere! For added security, the built in LED spotlights can turn on by motion activation and can also be controlled by the user's app. See someone who doesn't belong? Use the app to remotely turn on the built in ear splitting 110dB alarm to scare them away! Watch as they run off or talk back to get your point across. Built in night vision lets the Ring Spotlight Cam provide video even in pitch black without turning on the lights for discrete surveillance. Powered by the included plug-in power supply, you'll never need to worry about recharging batteries. 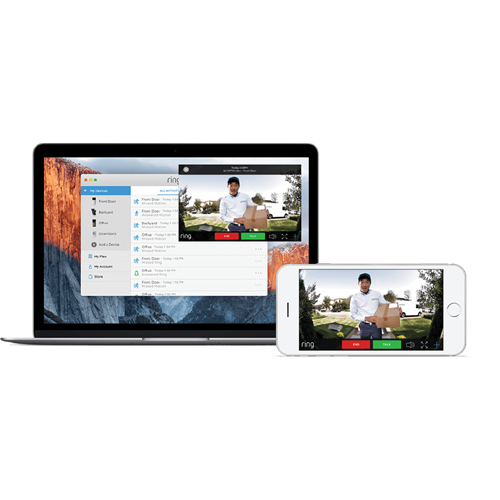 Ring is compatible with iOs, Android, Mac and Windows with free smart phone apps available. ** Ring requires an always on Internet connection with at least 1 MBps upload speed.